Garnet is a natural abrasive in dark red color, made of garnet mineral rock. It is inert and non-toxic, environmental friendly material, has a very low dust emission,which make it an ideal abrsive media for sand blasting, sand cleaning, water jet cutting, it is also suitable for lapping, making organic bonded abrasive tools, glass polishing, and used as water filtration media, etc. 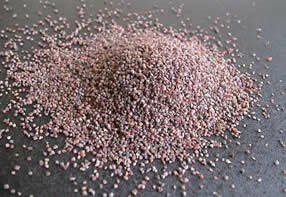 Abrasives garnet is one of the most important materials for abrasives tools and sandblasting. High temperature gravel pack for deep oil wells. Other sizes can be also available upon request.